Identification – 3/5 – While there are several purple/greenish/grey capped brittlegills, the charcoal burner is the only one with greasy, non-brittle gills – though old specimens/dry weather can result in flakey gills (as in the mature specimen in the picture above). The taste is pleasantly mushroomy, with no bitterness (see below for information on using taste as an aid to ID). Cap colour: Variable, usually mostly purple, but often with blue, grey, green and occasionally yellowish hues. 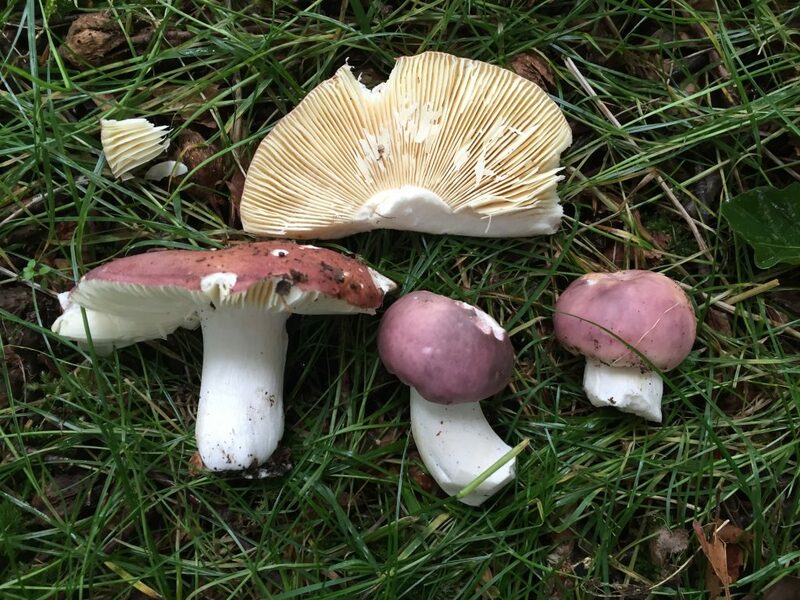 Be aware that there are several russula varieties that can have similar colours – none are dangerously toxic and the taste test will help reveal their true nature. Cap shape: Starting rounded, becoming flattened, occasionally upturned. Gills: Crowded, white, not crumbly (pliable and slightly greasy). White spores. Stipe: White, quite a crumbly texture when squashed. NEVER any hint of a ring. Habitat: Common under deciduous trees, usually, but by no means exclusively, beech. For those struggling to get to grips with mushroom identification, and even those with a fair bit of experience, the russula (also known as brittlegill) family of mushrooms can be very daunting. It contains over 200 species, all of which have more or less the same characteristics – pale brittle gills, white/cream coloured spores and squat crumbly white stipes. They are beautiful mushrooms that really illuminate the forest floor – most sport colourful caps from yellow to reds to greens to blues and purples. Many different species can share the same cap colour however, so close observation of cap shape, habitat, smell and taste are key to accurate identification without a microscope. 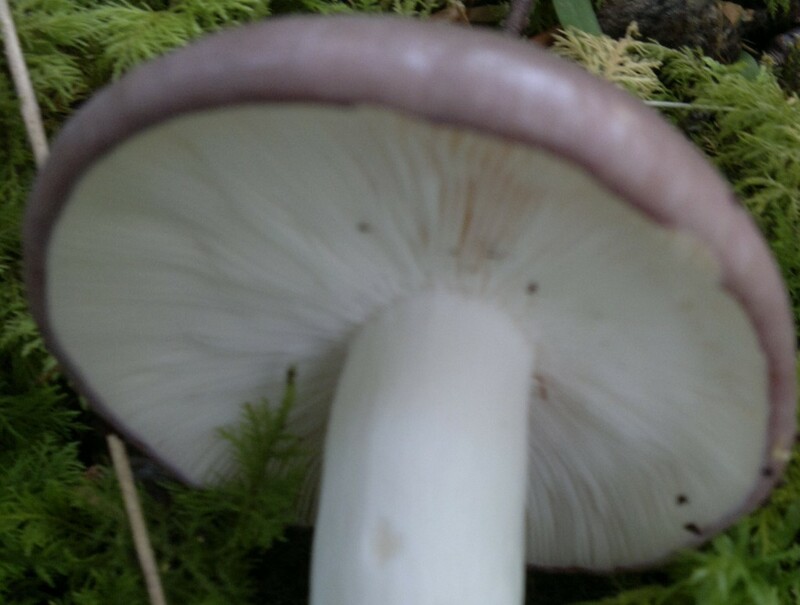 Using taste to help identify a mushroom may seem counter-intuitive in a world where potentially killers lurk, but if you are certain you are dealing with a variety of brittlegill (russula spp. ), and if you only taste (as opposed to eat) a tiny amount on the tip of your tongue, you wont come to any harm. Most russula are simply inedible. A few will give you a tummy upset. None are deadly. The good edible varieties of russula actually taste pleasant, with a crisp texture, often nutty flavour and no bitterness. Don’t take half the lesson here and go around tasting all mushroom species – i’m told some deadly amanitas taste quite pleasant! I recommend beginners focus their russula hunting on the charcoal burner and use taste as their final corroboration of their find. As the best of the edible russula, it is most easily distinguished by its pliable (ie. not crumbly) gills. That’s right…a brittlegill without brittle gills. Mushrooms are contrary like that! Russulas are a fantastic eating mushroom with a wide range of variety (200+ I believe), the good news is that there is no deadly poisious one here in the UK. Even the charcoal burner can come in a different cap colour as it would be expected.Russulas can come in all colours of the rainbow and in some cases you would need a microscope to identify a peticular species. I find the red coloured Russulas the most challenging, as they are very similar good and not good.I just lick the gills, the ones that can you give stomache upset are the ones that burns on your tongue and are very sharp. There are some very good eating ones that are a little sharp on your tongue, but will disappear with cooking. Also if you have a couple bad ones in your pot of plenty, it will not hurt you. Interesting point about the connection (or lack of) between tastiness and toxicity. We sort of assume that toxic things will always taste unpleasant, maybe as a result of the natural evolution of our tastes- fly agaric are pretty toxic (and hallucinogenic), but taste delicious, in my limited experience. I hadn’t heard of P.caerulipes before, but am aware of several other psilocybe species, their benefits and potential pitfalls. If you are new to using psychoactive fungi medicinally or recreationally, the trip advice listed on the page you supplied is good. Also, dosage (as with all foods/drugs/medicines) is key. Microdosing is quite fashionable just now – worth looking into. I grew up around people who would take 100’s of liberty caps in one sitting, which i’d equate to downing a whole bottle of whisky in one go – potentially troublesome! (Not that I haven’t done it and survived!) Working out the right dose for you, and your purposes is key. My advice would be to start small, take breaks (its possible to develop short-term resistance to the effects of psilocybes, so dosing, say, on consecutive days, can reduce the effect) build up, and reduce dosage, until you work out what works for you. I hadn’t heard of anti-cancer properties yet in psilocybes, but many other fungi have been proven to be useful in this area – e.g..chag, turkey tail.